Miniature Mario Kart Wiimote Projector Lights | OhGizmo! 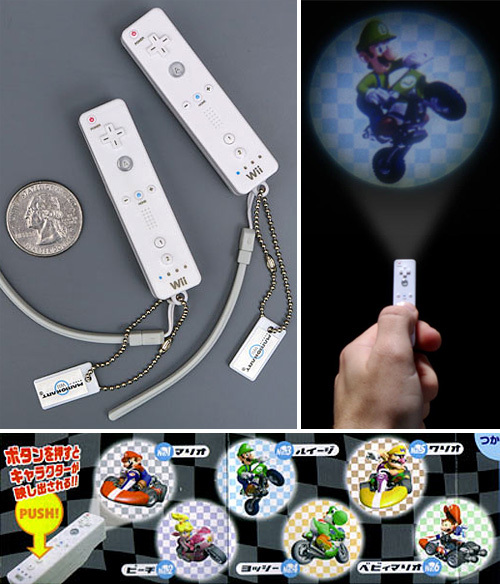 I’ve seen these types of mini projector flashlights before, but a) they weren’t shaped like a miniature Wiimote and b) they didn’t project characters from one of the greatest video game racing franchises of all time. So if you happen to be as big a fan of Mario Kart as I am, and don’t need a pocket-friendly flashlight that’s particularly bright or useful in any way, head on over to ThinkGeek who are selling these mini projectors which are actually fully licensed by Nintendo. It seems you don’t get to choose which of the 6 characters they’ll send you (Mario, Princess, Luigi, Yoshi, Wario & Baby Mario) but at just $5.99 I don’t see how you can go wrong. They look amazing! I'm going to buy one or two, hope i get Mario!